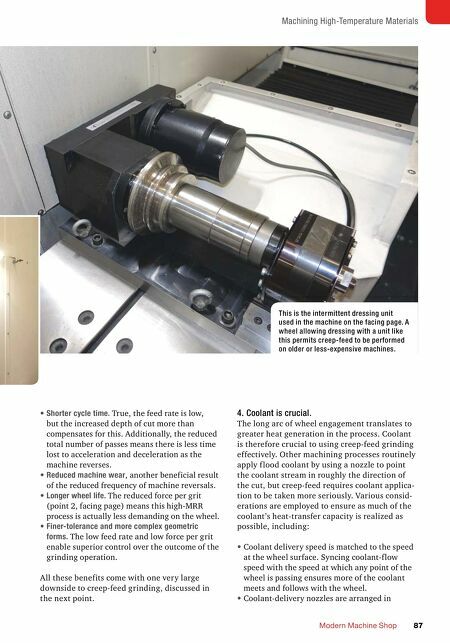 Machining High-Temperature Materials Modern Machine Shop 87 • Shorter cycle time. True, the feed rate is low, but the increased depth of cut more than compensates for this. Additionally, the reduced total number of passes means there is less time lost to acceleration and deceleration as the machine reverses. • Reduced machine wear, another beneficial result of the reduced frequency of machine reversals. • Longer wheel life. 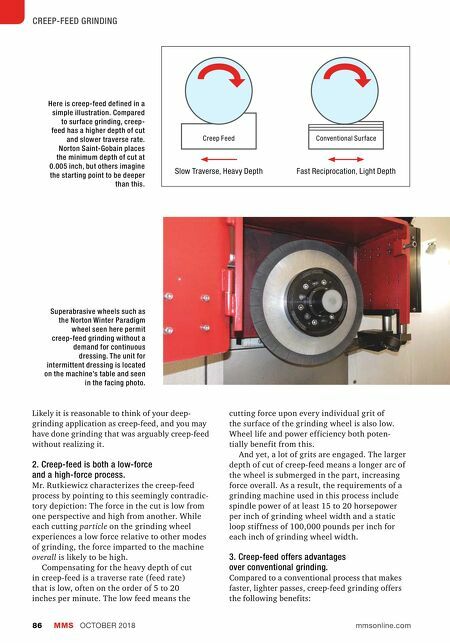 The reduced force per grit (point 2, facing page) means this high-MRR process is actually less demanding on the wheel. • Finer-tolerance and more complex geometric forms. The low feed rate and low force per grit enable superior control over the outcome of the grinding operation. All these benefits come with one very large downside to creep-feed grinding, discussed in the next point. 4. Coolant is crucial. The long arc of wheel engagement translates to greater heat generation in the process. Coolant is therefore crucial to using creep-feed grinding effectively. Other machining processes routinely apply f lood coolant by using a nozzle to point the coolant stream in roughly the direction of the cut, but creep-feed requires coolant applica- tion to be taken more seriously. Various consid- erations are employed to ensure as much of the coolant's heat-transfer capacity is realized as possible, including: • Coolant delivery speed is matched to the speed at the wheel surface. Syncing coolant-f low speed with the speed at which any point of the wheel is passing ensures more of the coolant meets and follows with the wheel. • Coolant-delivery nozzles are arranged in This is the intermittent dressing unit used in the machine on the facing page. A wheel allowing dressing with a unit like this permits creep-feed to be performed on older or less-expensive machines.